Politics is driven by the will of people who are aware to the environment; technology is driven by scientists, engineers and entrepreneurs. residential photovoltaic power systems; a lot of research is done to reduce the price of these systems (cheaper materials, automated production lines, mass production volume). As a matter of fact, rices dropped from $5-6 per watt in 2009 when started to build this site to $1-3 per watt in 2012. 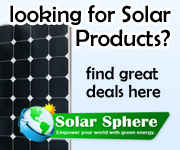 Bellow is a partial list of solar countries, the list is growing.